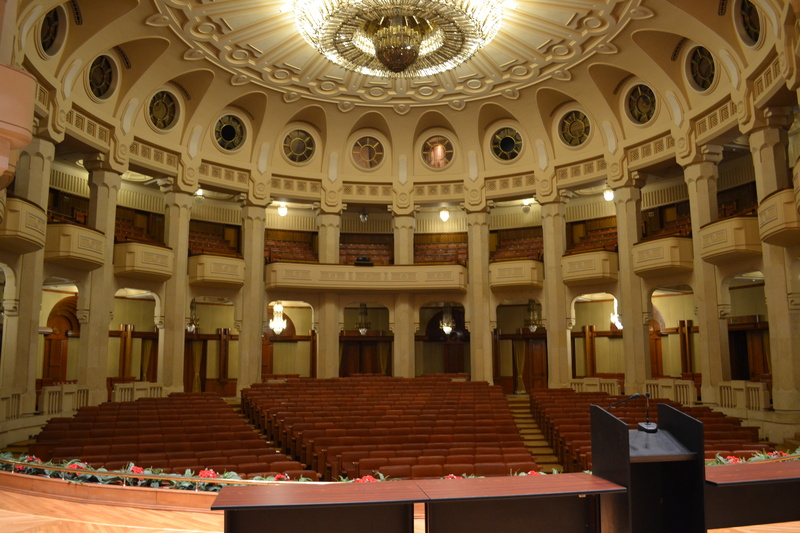 “How are you doing, Budapest? !” – Michael Jackson, during a visit to Bucharest. Fair enough, MJ. We didn’t know much about it either. 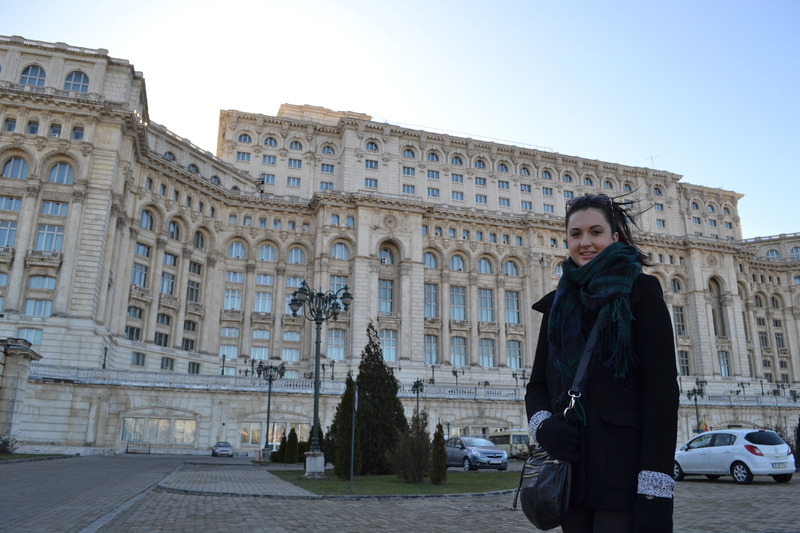 Which is a little surprising when we thought about it, given Bucharest is the 6th largest city in the European Union. Only London, Berlin, Madrid, Rome and Paris are home to more people, yet I could tell you nothing about the place other than that it had a large building in the middle (and even that fairly average fact came from Top Gear). Never mind, we were off to find out. And very excited about it, too! After a few months of being relatively settled while we set ourselves up in the UK, this was our first international trip since October, and we were definitely ready to see some more of Europe. I’d picked Bucharest almost entirely because the three-hour return flights were attractively priced at £30 or so at the time I was looking to book a trip (because how often does opting for the absolute cheapest option on anything ever disappoint? ), and so after work one Friday we set off. The flight landed at 2:45am, and after a half hour wait with some chain-smoking locals (smoking is still very much in vogue in Romania – it is even still legal to smoke inside there) we jumped on a bus into town. 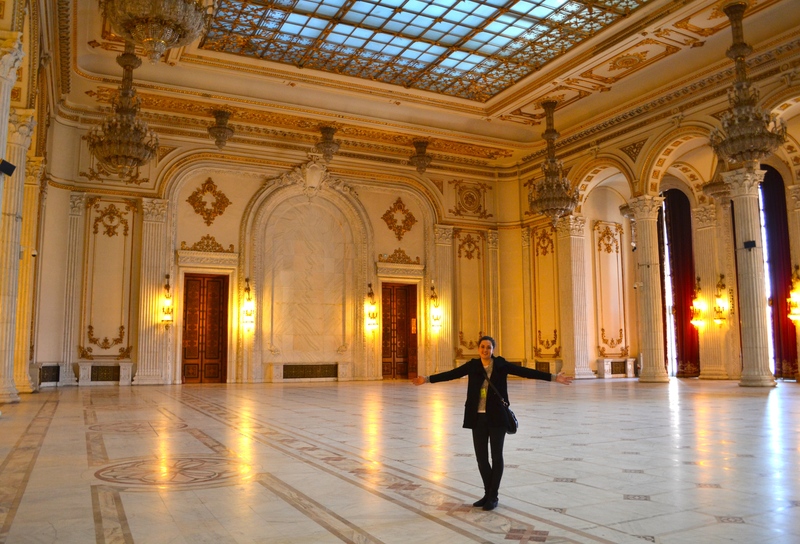 Our first impression: forget vampires, Romania is a nation of giants! Every single building and road looked fairly normal, even quite grand in places, but built on a scale about 70% larger than anything we’re used to. It felt very unusual. We also passed Bucharest’s imitation copy of the Arc de Triomphe, the imaginatively-named ‘Arcul de Triumf’, which looks very similar to its French inspiration but is only half the height. 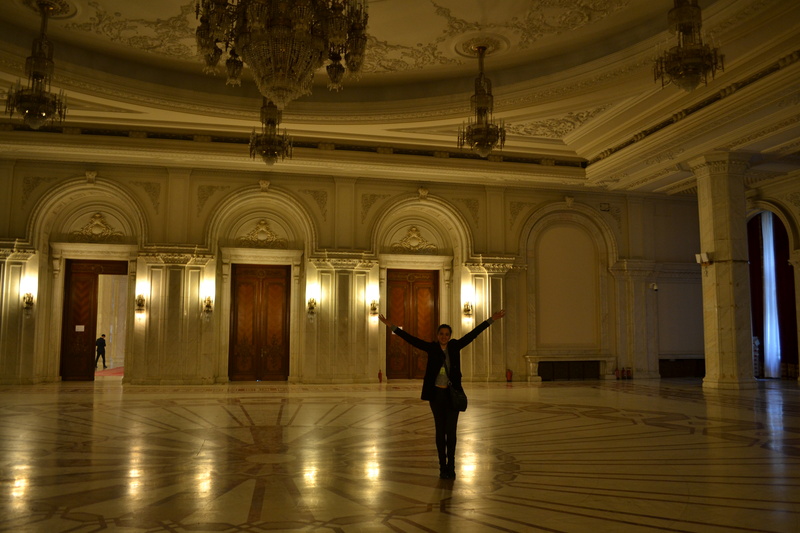 By about 4am we finally made it to our hotel, the Grand Hotel Continental Bucharest. It turned out to be every bit as good as the name implied – we both agreed later it was probably the nicest place either of us had ever stayed (Bridge still insists that this was an ‘intrepid trip’ – don’t believe her) – whilst also being among the cheapest places we’d been since arriving in Europe. Speaking of money, a bit of information I’d read before we arrived which left me mildly disappointed: Romania updated their currency a few years ago (they’re part of the Eurozone, but they don’t use the Euro) but if we’d been there before the change, the old exchange rate was such that we’d have been walking around with handfuls of 1,000,000 notes for the weekend. 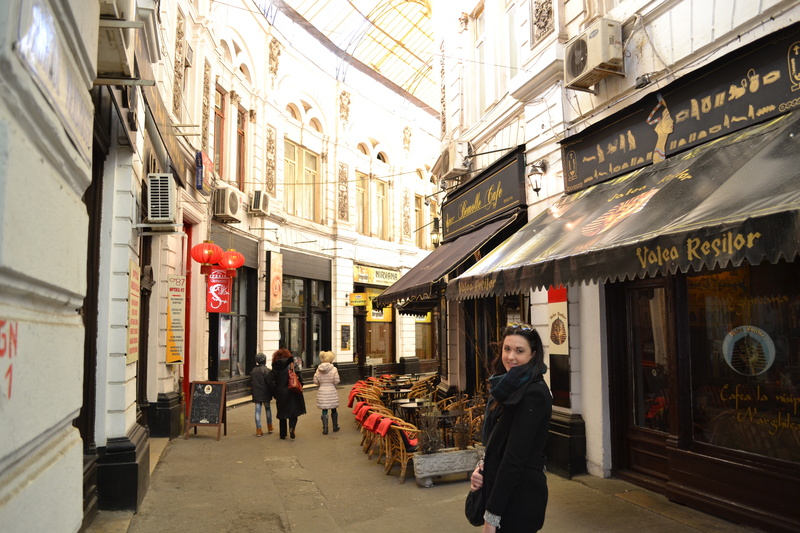 We overslept a little the next morning, woke up to find that the forecast rain had been and gone, and stepped out into a gloriously sunny Bucharest to go exploring. Our first stop was Paul, our favourite small family-owned bakery, because B ‘didn’t want offal for breakfast’. I wasn’t sure Romania did offal for breakfast, but it seemed a reasonable request all the same. We weren’t even offered offal, and Paul was as delicious as usual. 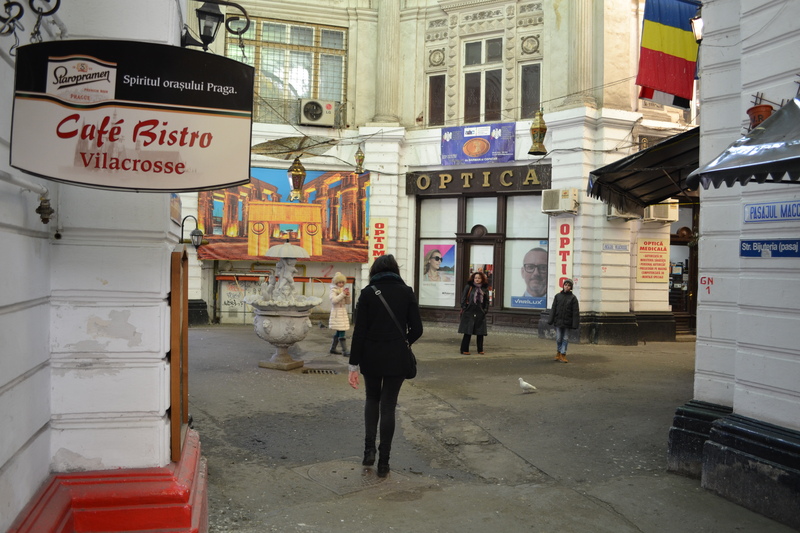 From there we set out towards the Palace of the Parliament, and found daylight definitely wasn’t doing Bucharest any favours – we were quite surprised to find just how run-down the town actually was, especially considering much of it doesn’t even date back past the 1970’s. 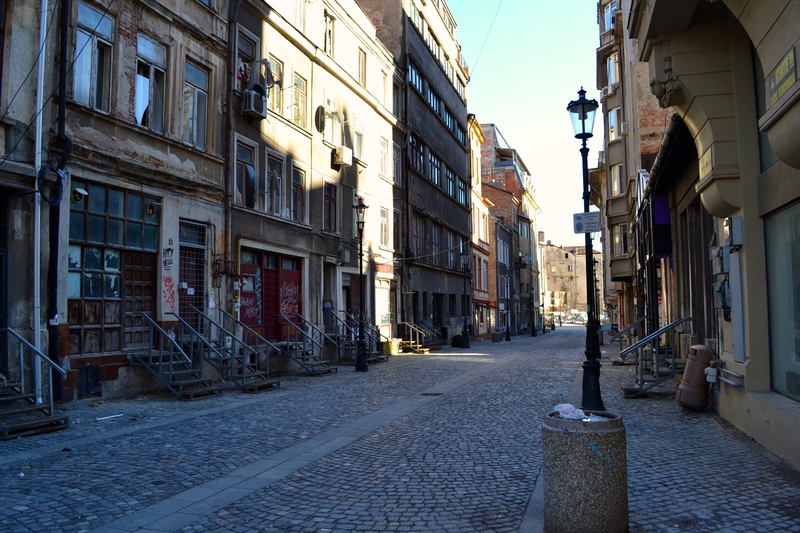 We walked through the Passage Macca-Villacroisse, apparently a shopping and café highlight of the old town area, and found it to be a little dire and, like much of downtown Bucharest during the day, almost completely deserted. We were beginning to find some more people as we got nearer the river, but they were mostly gypsies trying to sell car phone chargers through peoples’ windows. It is the second largest building in the world, after the Pentagon. It is the heaviest building in the world. It is so big it can be spotted from space. The 12 visible floors are big enough, but incredibly it is almost as big again underground – there are at least 8 more floors down there (at least because the official tour line is that there is only a couple, although we saw evidence of much more on Top Gear). 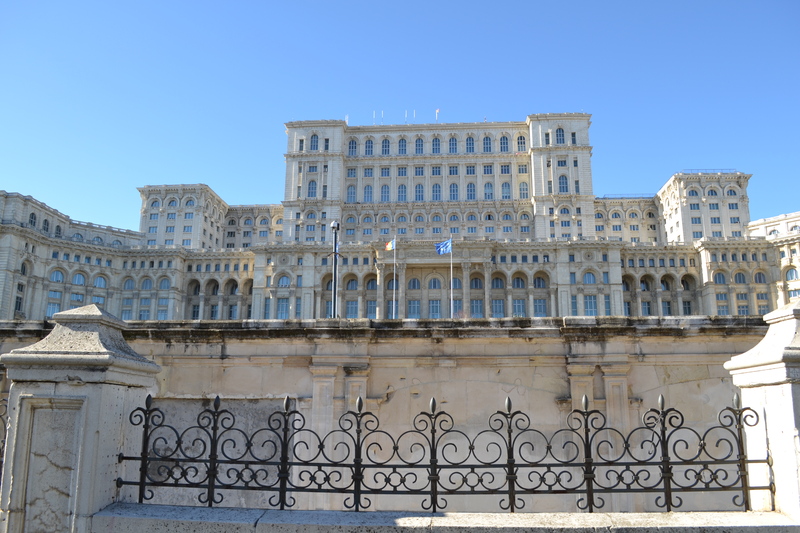 Between 1983 and 1989, the construction costs reportedly represented up to 40% of Romania’s total annual GDP some years. Since there was obviously a lot of building to learn about, we decided to join a tour group. Although it was an English language tour, aside from us and a solitary Asian gentleman, the rest of the group of about 30 or so were all local Romanians. The inside of the Palace is amazing, although curiously unfinished in places. We kept coming across exposed metal bolts poking out of the marble, or clumps of electrical cables draped all over the floor. Mostly though, it was just overwhelmingly impressive. My favourite part of the tour was probably coming across some weirdly out-of-place religious art in one of the corridors, which our guide explained was left over from a Hollywood movie shot there a few years back. The actual movie was set in the Vatican but the studio couldn’t get permission to film there. 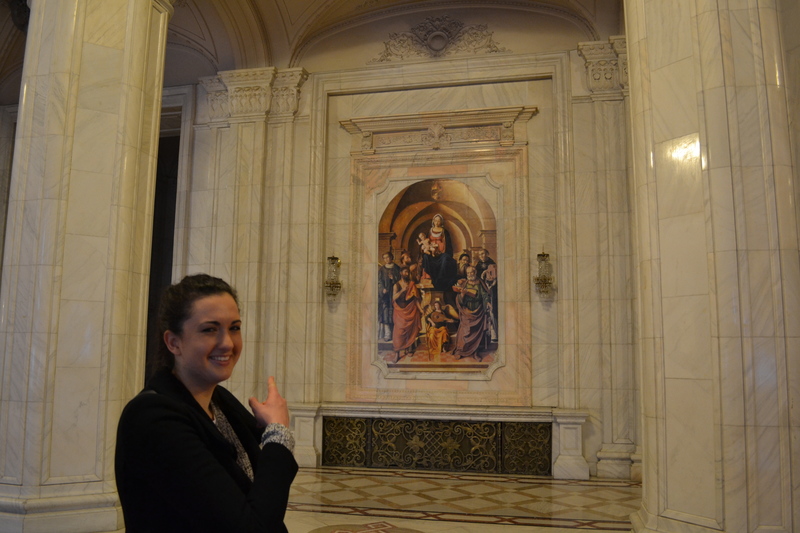 Obvious solution – stick some art on the walls of a palace in Romania, pretty much the same thing (good one America). After the filming the Romanians decided they liked the way it looked so they’ve just left it up ever since. After the tour we wandered back into town and stopped into a cafe for a beer, and accidently sat down in 1999. Vengaboys and Aqua pumping on the radio, and a Hugh Grant movie from right at the start of his career on the tv (on silent, like every tv in every bar throughout Europe). It was completely strange. Bridget loved it. Romania apparently got the top score in the EU recently for average broadband Internet speed (something like 4x faster than the UK), but it was quite hard to find much evidence of such a connection anywhere in Bucharest, or indeed any other sort of connection to the modern world. Later that evening, after a quick nap at the hotel, we headed out for dinner. A guy working at the hotel had spent at least 20 minutes writing us out his favourite three or four combinations of Romanian food to try at the local restaurants, and so at the place Bridge picked I thought I’d give some of it a try. The result: miscellaneous meat packages with polenta and fiery chilli, followed by the largest donuts (two, not just one) I’d seen. 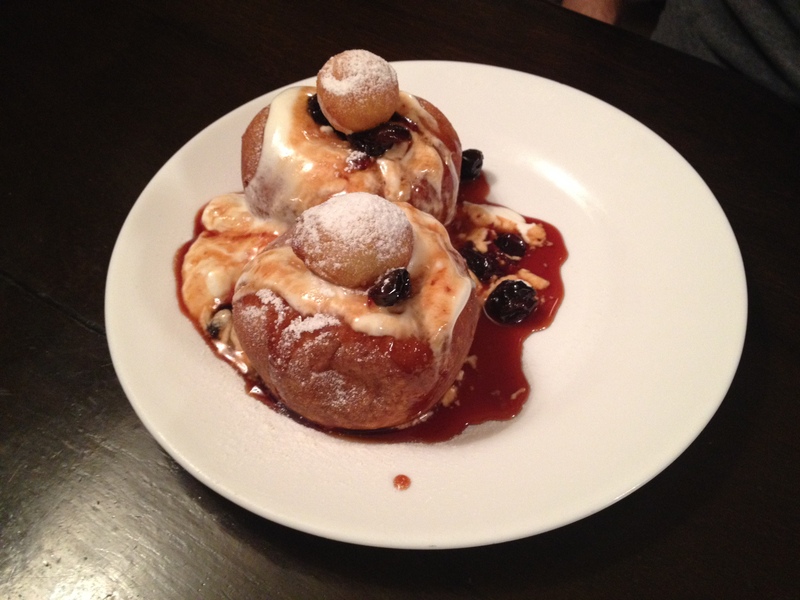 All very nice, but incredibly filling. Bridge had lamb skewers and apple pie. My favourite bit of the evening though was just the atmosphere of the place. The building was old, and full of character, and there was a four-piece band playing most of the night. Halfway through the meal the entire staff paraded through the restaurant, waving and bowing, to the general applause of everyone dining. Just after we’d recovered from that, a guy dressed as a mime started to make his way through our area. 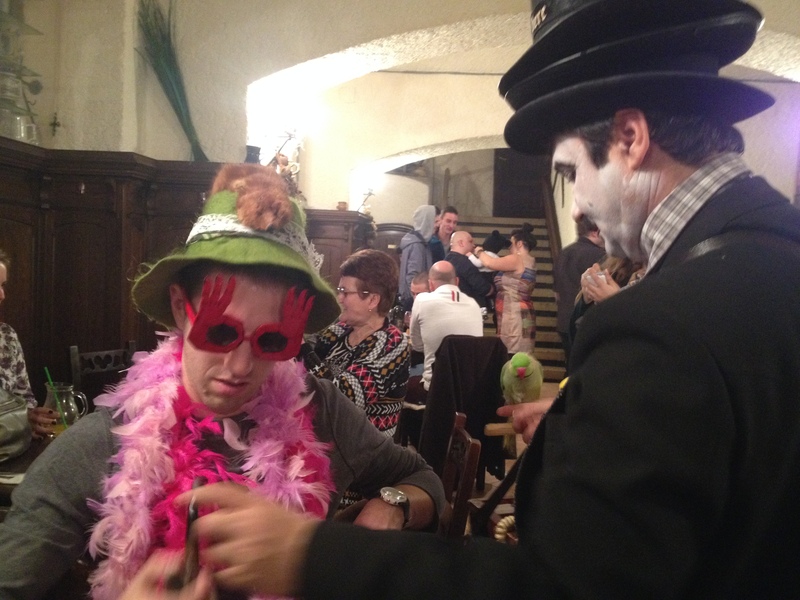 His act, it turned out, was to collude people into trying on whatever he pulled out of his bag, then strike a pose with his pet bird while the rest of the table looked on admiringly. I obviously tried it out. Finally, just before we left after dinner was mostly finished, the staff started pulling people up out of their chairs to take part in a big dance. All in all, a properly entertaining meal – we loved it. (‘Caru cu Bere’, for anyone who might be passing through). Sunday morning brought us sleet and snow, and made the city feel a lot drearier than the day before (what a difference sunshine makes on a place!). After a walk around the old town we sought shelter and coffee in Cafe van Gogh – a nice idea, but although we were seated in the non-smoking area the smoke itself didn’t play by the zone rules, so we didn’t stay long. And that was about it for Bucharest – after another hour or so hanging around town we caught a taxi to the airport (£5 for about 20km, so cheap) and headed for London. 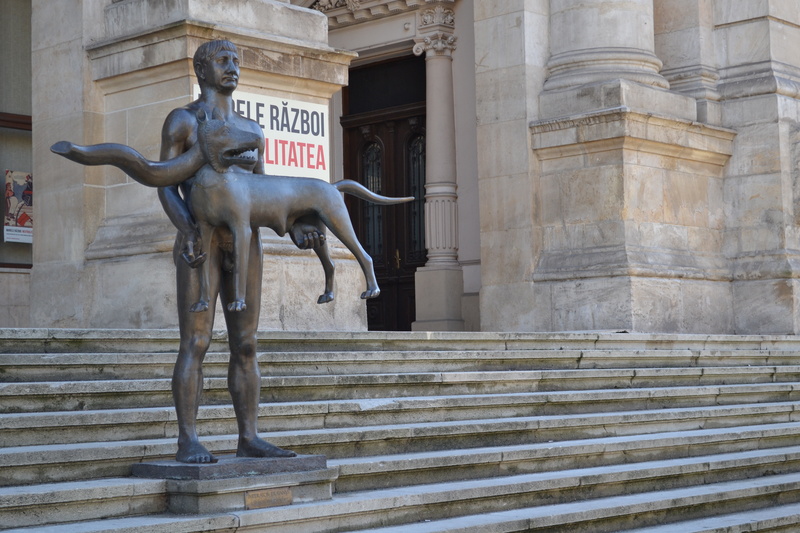 One last thing – I found my favourite statue ever in Bucharest. I couldn’t end without sharing. It is quite prominent on a main street, and you can see why – what a work of art.